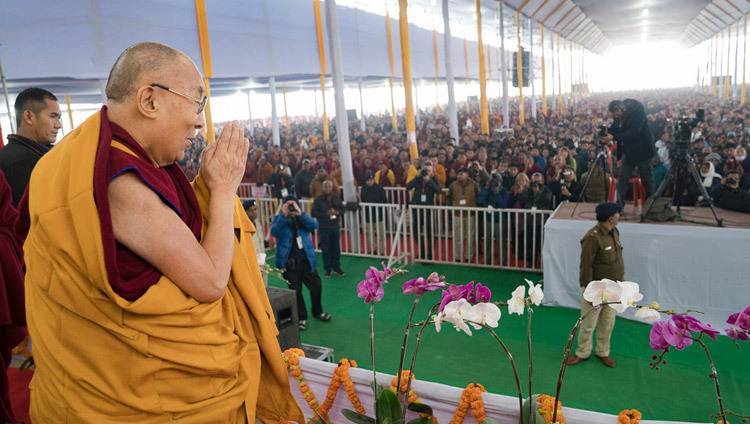 Bodhgaya, Bihar, India – Heavy fog and bitterly cold conditions in Bodhgaya this morning did nothing to subdue the enthusiasm of the more than 50,000 people gathered on the Kalachakra Maidan to listen to His Holiness the Dalai Lama. 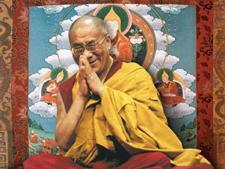 After a short drive from the Tibetan Temple to the top end of a huge marquee, His Holiness too was in a buoyant mood. He smiled, shook outstretched hands and waved to the crowd as he walked up to the front of the stage. He greeted several of the distinguished Lamas seated around the throne, among whom were the Ganden Tri Rinpoche, the former Ganden Tripa, the Shartse and Jangtse Chöjeys, the Sakya Gongma Trizin Rinpoche, and Ling Rinpoche, as well as Abbots, former Abbots and Tulkus.